NEW: Our own C60 Production (C60Star): Get it local in Olive Oil, Avocado Oil, and Sunflower Oil! Buy online! 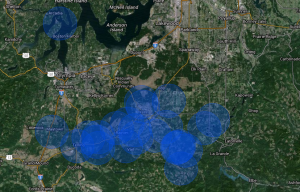 Free Honeybee Swarm Removal in Yelm, Rainier, McKenna, Roy, Tenino, Eatonville, Olympia, Lacey, and Tumwater in WA Washington State. BEEKEEPER FOR HIRE: Have your own honey bees, let us do the work! Take a moment and wrap your mind around these fabulous creatures that benefit humanity in all their activities by simply sustaining themselves. Contact us latest in November/December if you want to get started the following spring! Never forget: Keeping bees is a service to the community. It is not just about how much honey you make, it is also about securing our local food production by providing pollination through honey bees. Join the already existing network of pollination and see the difference you can make. The bee hives of our clients constitute a network of pollination benefiting thousands of people and animals in our region. Become a pollination angel yourself and expand and strengthen the network! Area Pollinated by Bee Forever clients (2015). 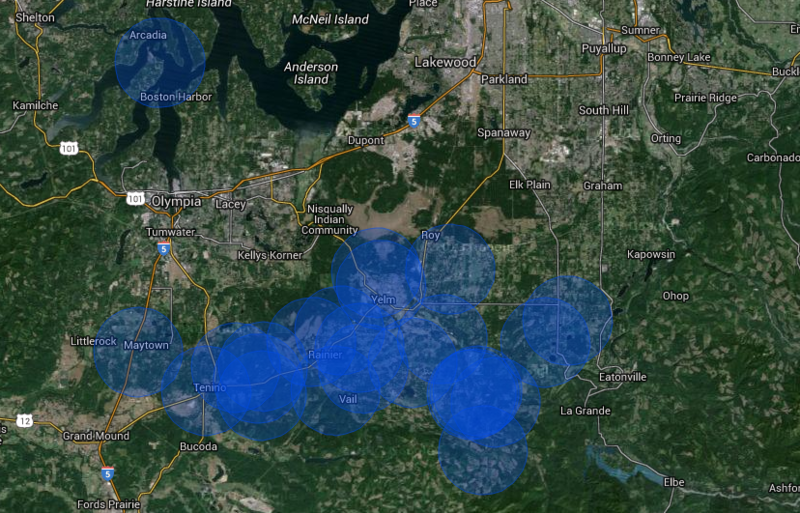 Every blue circle on the map represents one or more beehives of one of our clients and has a radius of 3 miles. This is a typical area that bees cover while foraging and therefore pollinating. Click here for more information on pollination.